Six composition notebook en cuarto: cantus, altus, tenor, bassus, quintus y sextus. 20 x 14 cm. The cover is the same in all composition notebooks with the only difference of the name of each voice. For each composition notebook: 3 pages of introduction (cover, dedication and index of composition notebook) and 52 pages of musical text,except in the composition notebooks quintus and sextus, which are 34 and 17 respectively. The pagination of the latter two composition notebooks is set to the first four, to match. 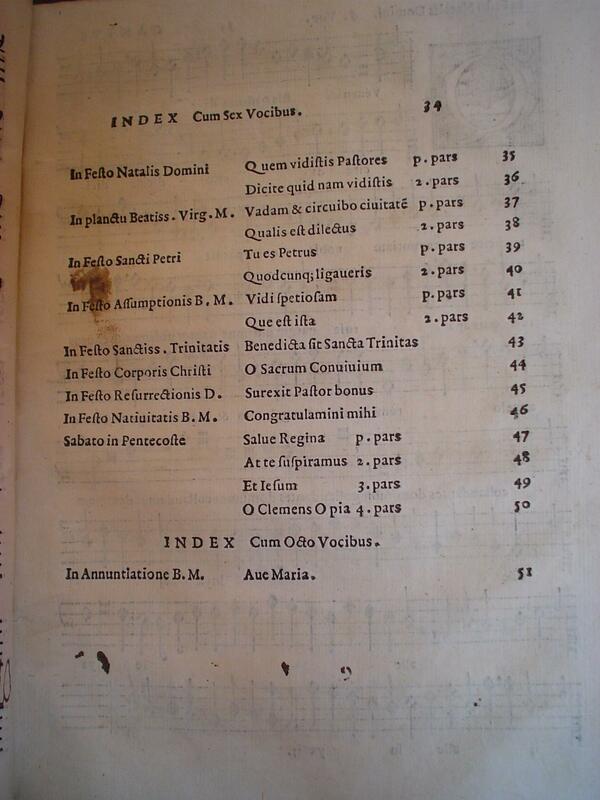 The motets are divided into four groups, with a corresponding index, depending on the number of voices, and within each group it observes a tendency, not always followed, to sort them according to the liturgical calendar. Cover: image from the specimen at Monasterio Cisterciense de Santa Ana, Ávila (Spain). Digitized by Nacho Álvarez©. The most Reverend Augustan Cardinal, my highest protector. 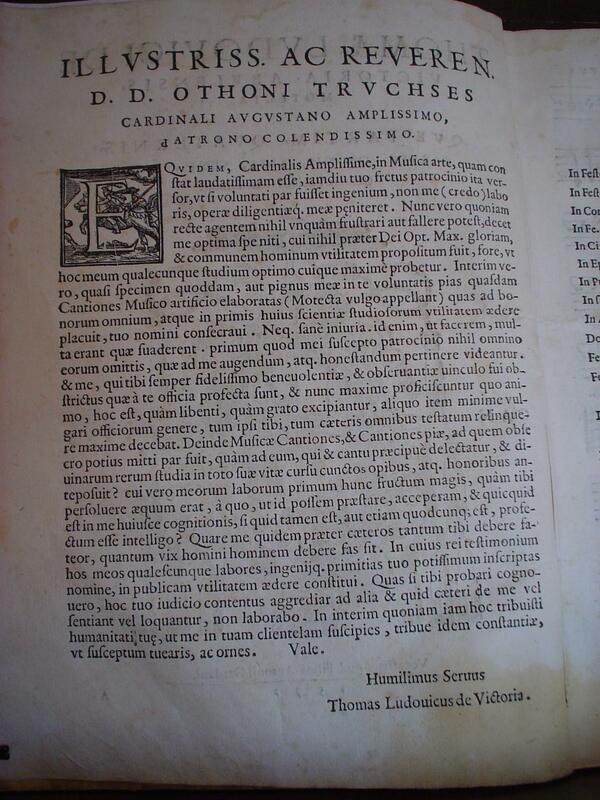 In fact, the most reverend cardinal, having been enjoying your protection for years now, I can manage in the music field –we know it is the best praised- in such a way that if my skill were the same as my will, I would not feel ashamed (this is just my humble opinion) of my work, my effort or my insistence. But, since nothing can ever disappoint or deceive that one who acts honestly, it would be really necessary for me, whose purpose was not at all different from the glory of God and the common benefit of humankind, to deeply intend and hope to reach everybody’s approval to get all my aims, whatever they might be. Meanwhile, as a proof or token of my behaviour toward you, I have addressed to your name some religious songs (people call them motets) which I dared to publish so that fair people, and specially music experts, could use them. And it is really meaningful due to the fact that many reasons were calling me to do it so. The first and most relevant is that, when you put me under your protection, you offered me anything suitable for my success and honour. But it was necessary, over all for me, who have always felt bound to you with a greatly trustful and respectful link, to put on record, not only for you but for everybody in general, through not simple tasks, which works I have accomplished, thanks to your support and how they are going on at the moment, that is to say how happy and satisfied I feel with them. Then, I wonder, to whom would it be better to offer the musical songs and the religious songs than to the one who does not only enjoy singing but he has also considered sacred studies over any other honours and possessions? Really, to whom was it fairer to hand up this result of all my effort than to you, from whom I had got it, to be thankful for any kind of knowledge, in case I have some, I am aware which came from you? That’s why I must declare I owe you more than others, as much as it is hard nobody could ever owe. And to provide a testimony of this fact, I decided to publish in your honour all these works coming out for the very first time from my skill. If I get to know you like them, I will happily devote myself to other works and I will leave apart other people’s opinions or remarks. And meanwhile, since with your generosity, you have included me among your protégés, I hope these protection and honour will be the fruit of your caring. Image from the specimen at Monasterio de Santa Ana, Ávila (Spain). Digitized by Nacho Álvarez©. Images from the specimen at Monasterio de Santa Ana, Ávila (Spain). Digitized by Nacho Álvarez©. Monasterio de Santa Ana, Ávila (Spain). Incomplete (four of the six booklets). ​Alfonso de Vicente describes in detail this exemplar: "four books of 24x17, 5 cm, corresponding to Cantus, Altus, Tenor and Bassus and bound in parchment. The bookbinding of the books Tenor and Bassus was restored in March 1984. Each part contains 52 numbered pages with index. Missing the following pages: Cantus (12, 13 , 52), Altus (cover, dedication, 12, 13), Tenor (12, 13, 14, 15), Bassus (cover, dedication, 6, 7, 12, 13, 22, 23, 28, 29). 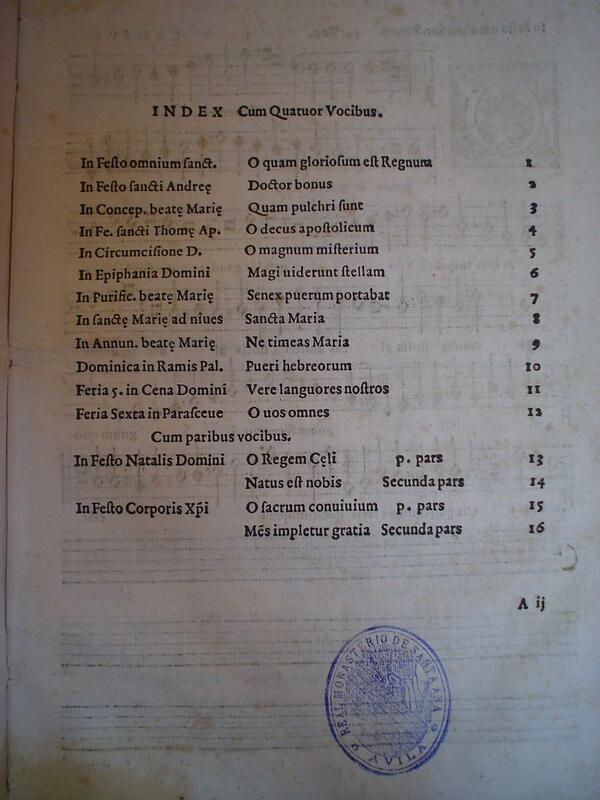 All have been photocopied the copy that preserved in the Royal College of Corpus Christi in Valencia. On page 31 of the Cantus says, "De Teresa Gómez es este libro. Quien le allare que se le vuelva que a la portería de Santa Catalina viegen". It also has manuscripts: In the altus in the rear guard, one bassus and one altus, without lyrics. In bassus (pp. 30-32 ) "Por dos ojos de mis ojos" (cantusand accompaniment) p. 49: two staves for tiple, no letter; p. 49-50 accompaniment of organ of Victoria motet Vidi speciosam". DIGITIZED SPECIMEN by Nacho Álvarez©. Archivo Diocesano, Valladolid (Spain). Music Archive section of the Cathedral. Signature: Libros impresos 26. Complete. 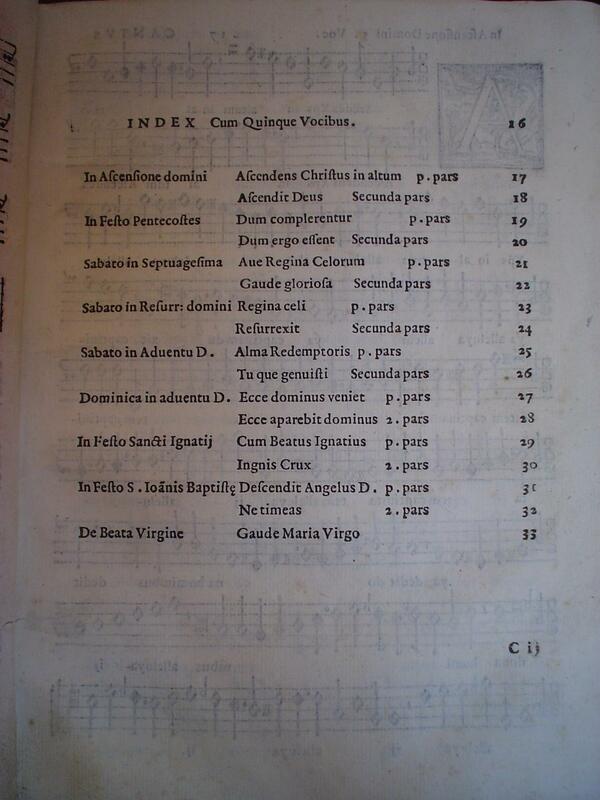 Soterraña Aguirre describes this exemplar: "Four printed paper booklets are conserved of this collection for the voices of Cantus, Altus, Tenor and Bassus with [iii]+52 pages and bound with parchment reused of a cantoral: Measure: 255x185mm. Sheet: 244x180mm. Box Write: 200x140mm. Printed with white mensural notation. His condition is acceptable, although there are loose or bent sheets, some stains use and Bassus booklet missed the first page. Surely all of these four booklets arrived at the Cathedral to Valladolid thanks to the donation in 1629 the unknown master Jerónimo de León. Among the six booklets that formed the original collection, most likely was deposited only the four that we maintain today". Real Colegio del Corpus Christi, Valencia (Spain). Incomplete. Santini Bibliothek, Münster (Germany). Complete.